The Great East Japan Earthquake took nearly 30,000 human lives, displaced more than 300,000 people and seriously affected the economy and life in entire Japan. The scope of damage from the tsunami is unprecedented and I feel very sorry from the bottom of my heart for the victims. Nevertheless, I cannot help thinking that we could feel certain and promote the recovery process more smoothly, only if the problem were limited to the immediate damage caused by the earthquake and tsunami. Unfortunately, this is not the case. I feel like as if a dark cloud is hanging over my head since the 11th March. The trouble at the Fukushima Daiichi Nuclear Power Station poses a very serious challenge to us. I was worried about such developments from the outset and already wrote on the 12th March on my BBS; I hope that the nuclear power station in Fukushima will not cause too much trouble. Unfortunately, the developments after this posting show that the reality is even worse than my expectation and we feel that this is not simply a natural hazard, but rather more a human-made hazard and the real cause is not of a simple technical nature but deeply rooted in the culture of Japanese nuclear community. showed us that their arguments were unfounded, though they may not have deliberately told a lie. Even after the disaster and now there are people who try to stick to the nuclear energy with some tightening of security measures at nuclear power stations. I cannot agree with such people that refuse to learn lessons from the worst accident and I am sure that their new assumption will again turn out to fall short. (1) The governmental agency in charge of nuclear safety is Nuclear and Industrial safety Agency. We should not forget that the Japanese nuclear community, comprising of politicians, bureaucrats, engineers, entrepreneurs and journalists, faced numerous accidents in the past, though they were not as serious as the recent accident at Fukushima Nuclear Power Station. Every time when a serious accident happened, responsible people publicly expressed apology and a post-accident survey was made. However, accidents continued to happen and even two nuclear workers died at a critical accident of Tokai-mura in 1999. Nevertheless, the tendency to conceal troubles and trivialize accidents continues as we experience since March and the review of the nuclear policy including establishment of nuclear fuel cycle has not taken place. It appears that the fundamental policy - namely Japan promotes peaceful nuclear use - is absolutely the major premise for everybody working for the nuclear industry and nobody is allowed to challenge it. Apparently critical opinions are suppressed and self-check function does not work in the nuclear community, because they are all in the same boat and they have vested interests in promoting the use of nuclear energy. I doubt whether security was really seriously considered and attached priority by the people of TEPCO and other people in charge of nuclear safety. Irresponsible culture dominates the nuclear community of Japan, I am now convinced - though this might be common to the whole Japanese society. It is not possible to eliminate every mistake or insufficiency from human activities. Therefore, we should always assume that our calculations may come out to be insufficient and we should use technology which can cause only limited damage even in case of serious accidents. The damage caused by nuclear accidents is not tolerable at all. We already experienced the seriousness of a nuclear accident from the case of Chernobyl and I did not imagine that we were to endorse the seriousness in our own country. We should not rely on such technology and irresponsible culture, if we would like to leave clean and productive environment to future generations. In other words, we have no other alternative than to totally give up nuclear energy. cannot count up all possible problems and take counter measures without omission. What, for example, might happen if crazy terrorists hit one of our nuclear power stations with a nuclear missile? I do not believe that nuclear power stations and reprocessing facilities are safe against nuclear attack and we in the Far East cannot exclude such a crazy scenario. It is not possible to contain the nuclear accident to 0% and in addition there is no perspective to settle the issue of final disposal of nuclear waste. The Earthquake showed us again that the earth of Japan is very instable. It is impossible to find places within Japan to dispose wastes and store them for tens or hundreds of years. Therefore, we should give up the use of fatal technology, scrap all nuclear power stations in Japan and stop building new ones. This is the most important conclusion we should draw from the Great East Japan Earthquake. I wonder why the opinion to abolish nuclear power plants has not grown up to be a powerful social movement as in Germany. 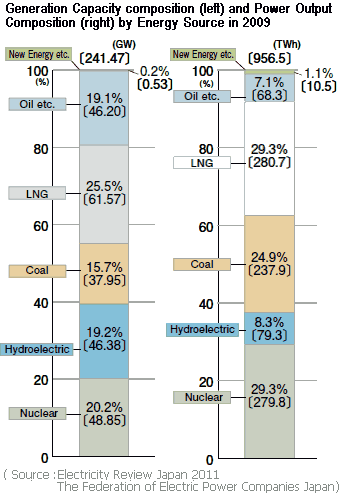 Fortunately, the share of nuclear power in the total power output is only 29% of the total 956.5 TWh in 2009 and in terms of generation capacity it is just 20% (Source : The Federation of Electric Power Companies of Japan). It does not appear very difficult to utilize hydropower more intensively and save 15% - the target rate of power saving for the coming summer in Tokyo area (2) - under the present technology. (2) According to the announcement of TEPCO on 15th April, the peak consumption in the coming summer is forecast to be 55 GW, while the power supply will be 52 GW at the end of July and 50.7 GW at the end of August. Therefore, we are required by TEPCO to save 15 % of our power consumption. Just after the earthquake, we started to save power consumption and the lighting in public space including restaurants and bars was turned down. Many of us felt rather happy about the result, because we have a quieter city life than before. As Governor of Tokyo Mr. Ishihara duly pointed out, we do not need glaring light for vending machines and pachinko parlors (3). (3) Governor Ishihara told in the official interview on 15th April that we can save 4.5 GW, if we give up vending machines and pachinko. However, the figure seems to be inaccurate. Producers of vending machines and owners of pachinko parlors say that they consume 0.255 GW and 0.85 GW respectively and this in total amounts to be mere 12.5% of the necessary saving. If we use more advanced technology, it is not difficult to raise the saving ratio and increase the share of new and renewable sources of energy such as wind, solar and thermal energy. Defenders of nuclear energy insist that Japan otherwise cannot meet the COP target to reduce CO2 emission. I do not agree to their analysis. We have plenty of possibility to utilize renewable sources of energy. We are told that the traditional value of Japan is to live in harmony with nature, while that of West is to control nature in lieu of God. If that is the case, now is the time to return to our tradition. We should give up technology which is not inherent to us. Only political decision making is necessary. For instance, Japan was an advanced country for the use of solar energy. However, in 2005 subsidy to promote installation of solar cells was abolished and the introduction of new facilities stagnated after that. However, the subsidy was revived in 2009 and the new installment of solar cells amounted to be more than 1.06 GW in FY 2010 (source: Japan Photovoltaic Energy Association(Internet site Japanese only). At the same time, we have to abolish the monopoly of regional electric power companies and to introduce supply network independent from those power companies as well as high performance smart grid, in order to promote denuclearization and decentralization of power generation. It is said that the lifespan of a nuclear power plant is more or less 40 years (4). If we do not build new plants and shut down those which have been used for 40 years, we can stop operation of all reactors by 2049. Japan has fortunately a decreasing population and does not need more electricity in the future. Therefore, it seems feasible to abolish all nuclear power plants even earlier, for example by 2040. What is needed it a strong political leadership. (4) There is no regulation concerning the life span of a nuclear plant. In the US a plant is licensed to operate for 40 years and in exceptional cases up to 60 years. All nuclear reactors will stop operation by the end of March 2012 ? The generation capacity of the 54 units of nuclear power plant 48.847 GW. However, only 60 to 70% of the capacity is usually utilized among others due to maintenance. After the accident at Fukushima Power Station, its six plants are out of operation. Some other plants were also out of operation because of regular maintenance and the operation rate already fell to 50.9% in April, according to announcement of the Federation of Electric Power Companies of Japan on 17th May. In May, two plants at Hamaoka stopped under the instruction by the Prime Minister in face of the risk of Great Tokai Earthquake and this news makes the operation of other nuclear plants difficult. Because of the suspicion of local people against the safety of nuclear reactors, once nuclear plants stops operation for maintenance, they can never get necessary permission by the governor of the relevant prefecture to resume operation. As a result the operation rate is sinking and now only 17 reactors are operating. 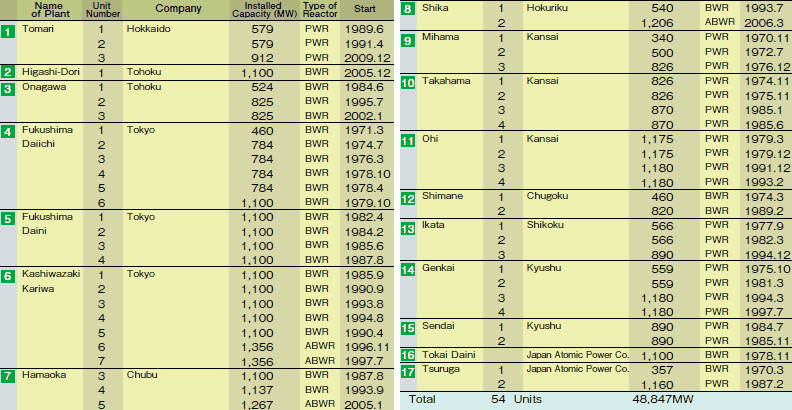 Now, the possibility is not excluded that all nuclear reactors will stop operation by the end of March 2012. The paradigm shift progresses quietly in Japan.